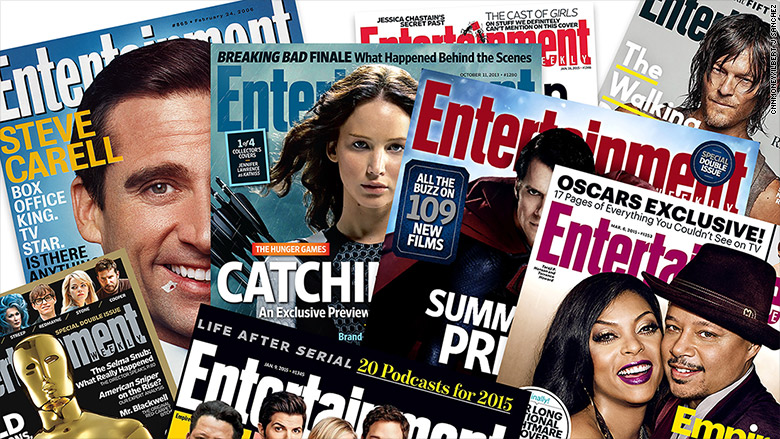 Entertainment Weekly to get partial pay wall. Making its web sites more like its print magazines, Time (TIME) Inc. is introducing a partial pay wall, beginning with Entertainment Weekly's site. The company says it's hoping to "accelerate revenue growth" and find out more about what its web readers want. Readers of Entertainment Weekly are already seeing the pay wall notification. The web sites of other magazines -- People, Time, Money, and Real Simple among them -- will follow Entertainment Weekly's lead later this summer. A Time spokeswoman declined to say when other titles, like Fortune, would also be subject to the new pay wall. "We'll be closely monitoring our roll-out and learning as we go," the spokeswoman said. People who regularly visit the site but don't pay for the print magazine will be prompted to sign up for a paid digital subscription or another paid product. The metered model -- free access up until a certain point when people have to pay -- has been pioneered by The New York Times and adopted by an array of other sites. Time Inc.'s announcement about it on Friday illustrates the media industry's determination to rely less on advertising revenue and more on subscriptions. Some analysts are skeptical that large numbers of web visitors will pay for news and entertainment, but that isn't dissuading publishers like Time Inc. from trying. "Deepening our relationships with digital audiences who value our premium content is of paramount importance to us," Time CEO Joe Ripp said in a statement. Friday's announcement has been expected for some time. Time Inc., like other magazine publishers, has to figure out how to make more money from its millions of web visitors. Time Inc. was owned by Time Warner (TWX), the parent company of this web site, until last year. In a preview of Time Inc.'s plans last week, Politico said, "The starting prices for unlimited access" to Entertainment Weekly's web site "will be $1.99 per month or $20 per year. For $25 a year, readers will also get a subscription to the print magazine." The company said Friday that "similar types of offerings to those available to EW.com visitors will soon be introduced on other Time Inc. sites and provide the company with the opportunity to more effectively understand its online visitors, craft targeted messages for them and help address their needs through existing and new products across all brands."